Marshall Tuck, who unsuccessfully ran against State Superintendent of Public Instruction Tom Torlakson in 2014, announced Monday he is running for the seat again. Tuck, who lives in Los Angeles, previously led Green Dot Public Schools, a network of independent charter schools, and Partnership for Los Angeles Schools, a turnaround organization that oversees district schools. Tuck said his platform will be focused on making public education a priority for California, citing statistics that the state’s fourth-graders rank 48th nationally in reading and 49th in math. He noted the state leads in other areas like the environment and healthcare. “We think it’s time for the state to really say we’re going to prioritize having the best public schools in the country,” he said. “Let’s as a state come together and make the big change that is necessary and not settle for being amongst the bottom,” he added. Torlakson, who was first elected in 2011, cannot run in 2018 due to term limits. No other candidates have officially announced their intention to run. The position is largely ceremonial, although the state superintendent sets the tone for education policy in California. In 2014, it was the most expensive race on the state ballot, which included the governor’s race. Tuck had financial backing from charter schools and education reform supporters, while Torlakson was endorsed by teachers unions, which also spent heavily to support his candidacy. A large focus of that race was the Vergara v. California lawsuit, which challenged teacher protections. Tuck supported the lawsuit. 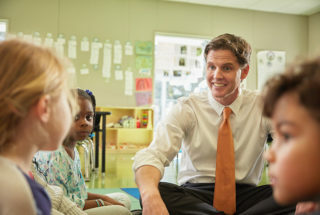 During this campaign, Tuck said his priorities would be around creating incentives to enter the teaching profession, professional development for teachers, more effective implementation of the Local Control Funding Formula to ensure funding is allocated for students with the greatest needs as the law is intended, sharing best practices, and giving schools more opportunities to be innovative. “I think the state’s job in many ways isn’t to tell districts what to do, but to find what is working” and share those practices, he said. Tuck said districts and traditional schools need to have greater autonomy to be innovative. “When we know we need big change, we’ve got to give our superintendents much more flexibility locally,” he said. One example he cited was Long Beach Unified School District’s request to substitute SAT tests for the 11th-grade Smarter Balanced assessments, a request the CDE denied. He said that kind of innovative thinking should be embraced and the state should have shown more interest in trying to work with Long Beach Unified, a high-performing urban district. When it comes to the California School Dashboard, the state’s new way to evaluate schools, Tuck said he likes that the system uses multiple measures, but the metrics need to be summed up in one or more numbers to be more user-friendly for parents. If elected, he said, he would work to change that. Tuck said he is opposed to for-profit charter schools and school vouchers. The primary is in June 2018.